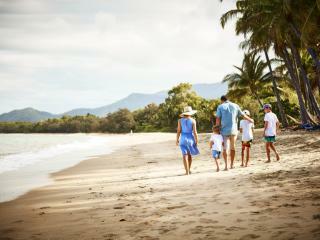 For the best deals on accommodation in Palm Cove see our huge selection of packages that will save you time and money. Enjoying an unbeatable location, Alamanda Palm Cove by Lancemore is the only accommodation in Palm Cove to boast an absolute beach frontage facing onto the spectacular Coral Sea. Opening up to become the Great Barrier Reef, the luxury accommodation and stunning location set Alamanda Palm Cove by Lancemore apart. Surrounded by coconut palms and ancient melaleuca trees, Alassio on the Beach Resort offers studio and 1, 2 and 3 bedroom apartment accommodation in an ideal location on the Palm Cove beachfront. The Mediterranean style and excellent facilities make it a popular place to stay. Located 30 minutes from Port Douglas and 20 km north of Cairns, Hotel Grand Chancellor Palm Cove offers stylish accommodation spread over 3 hectares of lush tropical gardens. The resort is also home to an amazing range of onsite facilities including a swimming pool including kid's slide, restaurants and more. Enjoying an exclusive location in Palm Cove, Imagine Drift Palm Cove offers luxury self-contained apartment accommodation with picturesque views of the Coral Sea. 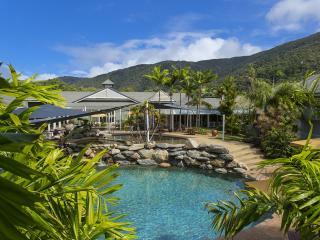 Boasting a great range of onsite facilities, the resort is also conveniently located within 30 minutes of Cairns. Taking its name from the stunning ancient mango trees that surround the property, Mango Lagoon Resort & Wellness Spa offers deluxe accommodation in a relaxing atmosphere. Just a short stroll to the beach, the rooms at this resort are surrounded by lush tropical gardens and enjoy refreshing breezes off the Coral Sea. Offering modern beachfront accommodation, Mantra Amphora features a choice of hotel rooms and apartments with spacious interiors, an excellent range of amenities and breathtaking views of the Coral Sea. 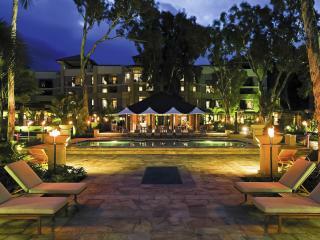 The ideal place to relax, the resort is just a short stroll from a range of shopping and dining options. Marlin Waters Palm Cove, between Cairns and Port Douglas, is a superb spot to lodge yourself or your family and friends to explore Far North Queensland. 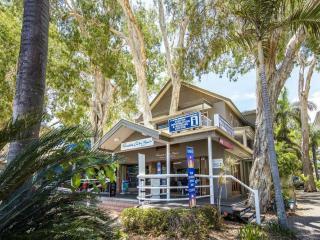 In just 30 minutes drive north from Cairns town centre and Cairns airport, you will find the relaxed seaside pocket of Palm Cove, and the unit accommodation at Marlin Waters beachfront apartments is just behind the magnificent melaleuca trees along Williams Esplanade, directly opposite the beach. An exclusive and secluded holiday experience, Oasis at Palm Cove is set in its own peaceful cul de sac and offers a luxurious range of 1, 2 and 3 bedroom apartments. Home to an impressive range of onsite facilities, including a 25m lap pool, spa, barbecue entertainment gazebo, all amogst lush tropical gardens. Surrounded by tropical swaying palms, Palm Cove Tropic Apartments offers a relaxing holiday experience where you can get away from it all. Despite its tranquil atmosphere, the resort is conveniently located just a short stroll from the beach, a range of local activities and attractions and is just 20 minutes from Cairns. Enjoying an enviable location directly opposite the soft sand beach, Paradise on the Beach is surrounded by palm trees and offers a more intimate boutique hotel experience. Choose from studios or suites and relax in the unique atmosphere that Tropical North Queensland has to offer. Renowned as one of Tropical North Queensland's most sophisticated resorts, Peppers Beach Club & Spa offers a luxurious choice of stunningly appointed spa rooms and 1 and 2 bedroom suites overlooking the beach. The resort also features cascading waterfalls, lagoon pools, gardenia blossoms and more. Located at the gateway to the Daintree and Great Barrier Reef, Pullman Palm Cove Sea Temple Resort & Spa enjoys prestigious beachfront and contemporary studio, 1, 2 and 3 bedroom apartment, penthouse and villa accommodation surrounded by a sea of natural beauty. Offering a complete luxury holiday experience, Sanctuary Palm Cove offers deluxe 1, 2 and 3 bedroom apartments with subtle attention to detail that makes your stay a truly wonderful experience. Whether you want to explore the further reaches of Tropical North Queensland and experience the magic of the Great Barrier Reef or simply relax in seclusion, The Reef House - MGallery by Sofitel is the ideal place to do it. The resort enjoys boutique accommodation directly opposite the beach and a fantastic range of facilities. Just metres from the spectacular Palm Cove beachfront, The Reef Retreat offers a boutique range of suites and apartments surrounded by lush tropical palms and ancient melaleuca trees. 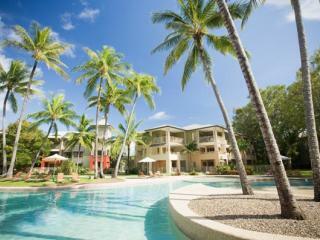 The resort offers the ultimate in comfort paired with the charming atmosphere of Tropical North Queensland. Offering family friendly accommodation, The Villas Palm Cove features self-contained accommodation surrounded by lush tropical gardens. The resort also boasts an outstanding range of onsite facilities including a heated spa, undercover BBQ areas and much more.